Families with children not wanting to move to low-density suburbs need urban neighborhoods and an urban public realm designed to support culturally diverse, socially stimulating, healthy lifestyles. Growing IN Place addressed the need for planning and design policies that support these needs, especially for children. Young people need networks of attractive, walkable/bikable routes connecting homes to schools, parks, community gardens, and cultural institutions – where they can engage with nature. 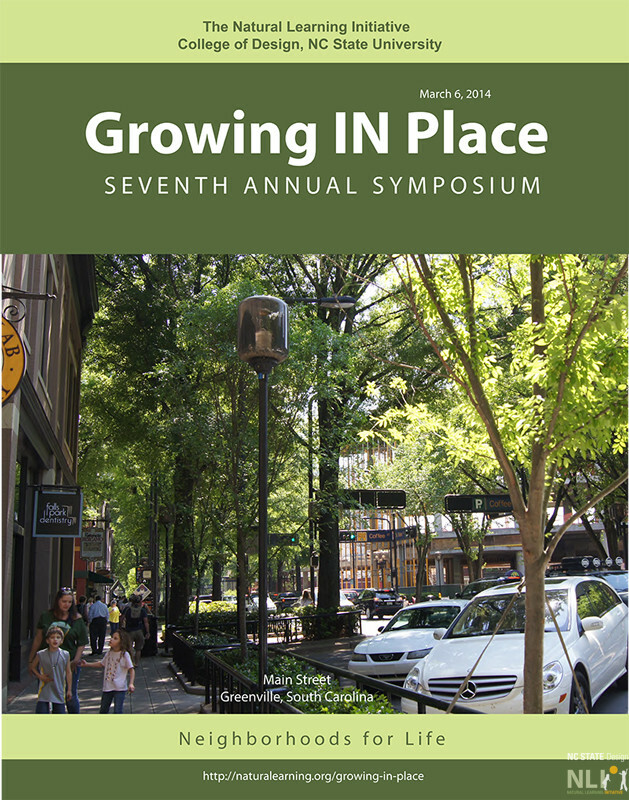 Growing IN Place addressed a regional audience (NC and adjacent states) of multiprofessional, interdisciplinary, public/private sector, professional landscape architects, architects, and planners (receiving CEUs); parks and recreation professionals; nonformal educators, and elected officials. Molly Simpson, B.A., Urban Land Institute (ULI), Terwilliger Center for Housing, development and implementation of educational and research programs on housing policy and practice. Family-friendly, moderate density housing. Responding to the market. Noreen McDonald, PhD. Department of City and Regional Planning, UNC. An expert on active transportation between home and school. School location and non-motorized, independent mobility. Is there a way out of this conundrum? Lois Brink, MLA. Department of Landscape Architecture, University of Colorado, Denver; Director, Learning Through Landscapes; community design of urban school grounds; post-renovation health impacts. School-ground renovation as a multi-benefit school/community enterprise – an international movement. Mary Eysenbach, MS. Director of Conservatories, Chicago Park District; Founding Board Member, City Parks Alliance; Director, City Parks Forum, American Planning Association. City parks and families with children. Robin Moore, Dipl.Arch, MCP. Department of Landscape Architecture, NC State University; Director, Natural Learning Initiative. Nature play and learning spaces –National design and management guidelines. Allen Cooper, MPP, JD. Director, State and Local Education Advocacy, National Wildlife Federation. Risk management of nature play and learning spaces.